"Baltimore Oriole" Licensed under Public Domain via Commons. Each morning, very early, I walk to the 3 areas where they dine on their meals of oranges, and a mixture of meal-worms and grape jelly. Always, I hear the staccato-like chatter as they wait for their breakfast in the trees in our gardens... it is not chirping, the sound is unique to these birds. And always, I smile because I feel privileged- honored, really- that these splendid creatures come here and trust they will find the nutrition they need to nurture themselves and the babies they fly thousands of miles to have here in the high Sierra's. In June, now, they search through the jelly mixture for the meal-worms- I have learned this is the protein they require for the babies. I assume the kids are getting hungrier and are demanding more protein to fuel their growing bodies. Occasionally, their feet drag detritus from their nest to leave on the sticky lip of the jelly jar. Today, there was a long strip of what looked like very thin plastic tape, about 6 inches of it, reminding me of the tapes we used to play long ago but thinner and with white checks, stuck to the top of one of the containers. While adding a generous supply of meal-worms to each of the 3 containers, I thought about why this gives me such pleasure, aside from the obvious joy of seeing these outrageously colored birds amidst all of the other mostly brown, black colored birds which merge with the muted natural landscape of the desert. I think of Eden now and then. Of a place where all of creation - all of us creatures were in a sense, one. We, humans, had dominion but the word does not imply any perversion of power or hierarchy, rather it implies a deep reverence for all creatures, an understanding that supersedes words because perfect communication can exist only without words. A place where the meaning of that peculiar staccato chatter of these splendid creatures was clear to us because we understood the gratitude, the love. We understood because we shared the gratitude in each moment, in the splendor and the goodness of each tree, plant and creature... the shared peace of each moment and the love for each one of us. Lin Wilder, DrPH is a former Hospital Director. She now writes full-time. ORIOLES are quickly becoming one of Americas favorite wild birds. 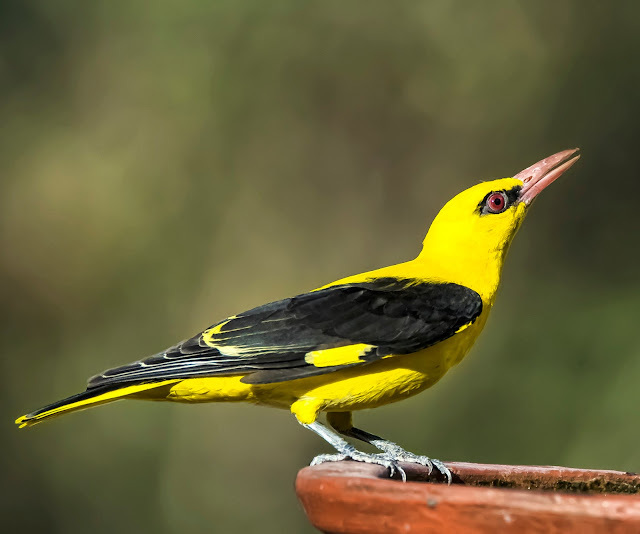 While over eight species of Orioles can regularly be seen in the United States, we want to look at the "Major Three" species - Baltimore, Bullocks and Orchard. If you wait until you see them, you are "too late" to attract Orioles, in maximum numbers, to your yard. Not so much wild bird seed but bird food like ORANGES are one of the "keys" to attracting Orioles. Cut oranges in half and provide them "juicy side out" for a refreshing snack for these beautiful birds. You can also attract these wild birds up close by offering oriole feeder nectar, jelly and fruit on the feeders by the house and patio. Many people feed jelly year-around, not only Orioles, but Woodpeckers, Robins, Warblers and others enjoy it. Many people have said that they keep Orioles longer now that they feed grape jelly!!!! There are a lot of people who claim that their favorite Oriole nectar feeders are Oriole Feeders. Why? Their wide mouths and flat tops, make them easy to fill and clean (base also comes apart easily to clean), and some have bee guards to make sure that Orioles - not bees - enjoy the nectar. If you're worried about ants bothering your jelly or Oriole nectar, there are guards to put on and hang oriole feeders with clear nectar protector ant moats above them and fill with water. This acts like a moat, similar to those around the old castles and has a similar effect. As you are probably well aware, ants can't swim, and for a few extra dollars you'll never have to mess with cleaning them out of the feeder. These also work well with hummingbird feeders. While it is often advised that it is good to mix their own humming bird nectar from sugar, some opinion is that commercial Oriole nectar will attract and hold more Orioles and other wild birds at the feeder longer.